China’s “New Silk Road” is Beijing’s latest project aimed at creating a belt of railroads, highways, pipelines and broadband communications stretching through China to the West, and a “maritime Silk Road” combining sea routes with port infrastructure from the Indian Ocean to the Mediterranean. This project comes at a point where the role of the US in the Middle East is declining, and it is likely that China will aspire to adopt a larger role in the region. Israel’s geographical position and technological advances makes it possible for Israel to play a bridgehead role in the project, and the opportunity to shape Chinese thinking and strategy in the region for decades to come. China’s “New Silk Road” might become history’s most ambitious investment in infrastructure. Some Chinese strategists predict an Israeli role in the project on par with, or possibly even more important, than that of Turkey. China calls the project “One Belt and One Road,” referring to a belt of railroads, highways, pipelines and broadband communications stretching through China to the West, and a “maritime Silk Road” combining sea routes with port infrastructure from the Indian Ocean to the Mediterranean. Israel’s location makes it possible for the Jewish state to “play the role of bridgehead for ‘One Belt and One Road’ with the completion of the ‘Red-Med’ rail project,” said Dr. Liu Zongyi at a November seminar at Remnin University. Dr. Liu based at the Shanghai Institute of International Studies, spoke of a $2 billion, 300 km rail line linking Ashkelon with the Red Sea. The “Red-Med” project is usually presented in more modest terms, as a way of absorbing excess traffic from the Suez Canal, or an alternative route in the event of political disruption. What China calls “One Belt and One Road” proposes that China, with the Mediterranean on the East-West axis, will have the opportunity to create high-speed rail lines in Southeast Asia, India, and Africa. China aims to double its 12,000 kilometers of railway track by 2020, with high-speed lines comprising most of the expansion. It is building a rail network south through Thailand, Laos and Cambodia to Singapore, and west to Istanbul. Some Chinese strategists see “Red-Med” as emblematic of a more ambitious design for the region. For example, Sino-Israeli collaboration aims to include counterterrorism and anti-piracy operations, as well as economic support for Arab countries. Israel can provide advanced technologies, such as in agricultural, to support the industrialization of the Middle East in the context of “One Belt and One Road.” The Chinese have even pointed out to Israel that their navy is conducting anti-pirate missions in the Indian Ocean and The Gulf of Aden that Israel can participate in. The project implies a radical shift in China’s perceptions of regional security in the Middle East. China’s net oil imports have nearly tripled in the past decade, from 100 million tons per month in 2005 to nearly 300 million tons today, and most of the increase has come from the Persian Gulf. China’s dependence on Middle Eastern oil will continue to rise. Until recently, China was content to follow America’s lead on Gulf security. After the collapse of Syria and Iraq, however, China’s complacency has turned to concern, and China is seeking ways to enhance its regional security presence without, attempting to play a superpower role in the region. There is a new consensus in China that the world’s second superpower will have to play a more central role in the Middle East. But the suddenness of America’s decline in the region has left China unprepared and unsure of its next steps, as Chinese analysts are quick to acknowledge in private conversations. China has joined the P5+1 negotiations with Iran and offered to become a fifth member of the Quartet (UN, US, Europe, Russia), but these are pro forma proposals to assert China’s interest in the region rather than a policy per se. In the past, China has voted with the Palestinians at the United Nations, and it will not alter its diplomatic position in the foreseeable future. There is an overarching theme to Chinese policy, though, and it stems from China’s economic strengths. The transformation of the Eurasian landmass by high-speed transport and communications will lift large parts of the continent out of backwardness, China believes, and make long-term political stability possible. Building the New Silk Road, though, demands the suppression of security threats that could disrupt trade flows. In both respects Beijing is sizing up Israel as a strategic partner. Not until 2014 did China come to the conclusion that the United States would fail to stop Iran’s drive for nuclear weapons. Under the assumption that it was working under an American security umbrella, Beijing attempted to maintain a delicate balance in its relations with Saudi Arabia and Iran. One Chinese analyst observes that although China’s weapons deliveries to Iran are larger in absolute terms than its sales to Saudi Arabia, it has given the Saudis its best medium-range missiles, which constitute a “formidable deterrent” against Iran. As China sees the matter, its overall dependency on imported oil is rising, and the proportion of that oil coming from Iran and its perceived allies is rising as well. Saudi Arabia may be China’s biggest provider, but Iraq and Oman account for lion’s share of the increase in oil imports. China doesn’t want to rock the boat with either prospective adversary. That policy worked well when the US stood for surety for peace in the Persian Gulf, but it has reached its best-used-by date and Beijing is still considering what to do next. How India will interact with the “New Silk Road” is not yet clear, but it seems increasingly likely that India and China will collaborate rather than quarrel. After President Xi Jinping’s September 2014 state visit to India, the new government of Narendra Modi may draw on Chinese expertise and financing to alleviate critical infrastructure bottlenecks. The two countries are negotiating a $33 billion high-speed rail scheme, for example, the first major improvement in a rail system built by the British in the 19th century. Economics trumps petty concerns over borders in the mountainous wasteland that separates the world’s two most populous nations. There also is a strategic dimension to the growing sense of agreement between China and India. From India’s vantage point, China’s support for Pakistan’s army is a concern, but it cuts both ways. Pakistan remains at perpetual risk of tipping over towards militant Islam, and the main guarantor of its stability is the army. China wants to strengthen the army as a bulwark against the Islamic radicals, who threaten China’s Xinjiang province as much as they do India, and that probably serves India’s interests as well as any Chinese policy might. Meanwhile the rise of Islamist extremism worries Beijing. At least a hundred, and perhaps many more, Chinese Uyghurs are reportedly fighting with Islamic State, presumably in order to acquire terrorist skills to bring back home to China. Chinese analysts have a very low opinion of the Obama administration’s approach to dealing with IS, but they do not have an alternative policy. 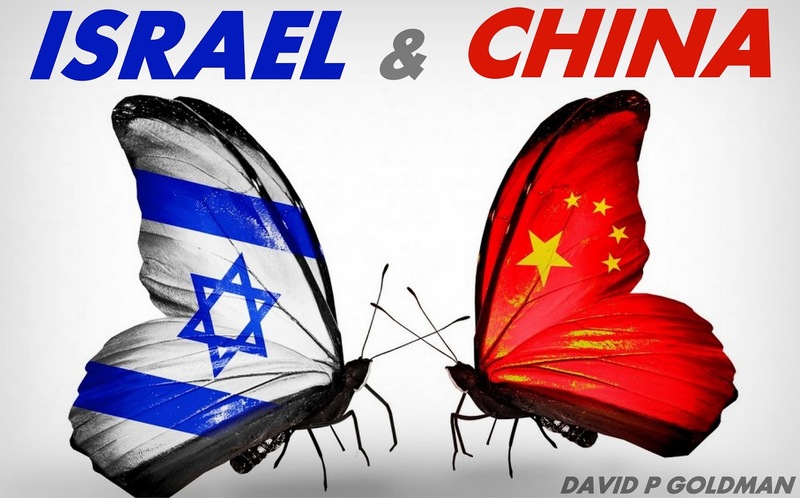 There is an opportunity for low-profile but significant security cooperation between Israel and China. China’s role in Egypt exemplifies how Beijing may use its economic muscle to contribute to regional stability. Egyptian President Fatah al-Sisi signed a “comprehensive strategic partnership” with China during his late-December state visit to Beijing. China envisions a second Suez Canal flanked by a high-speed rail line, as well as “cooperation in infrastructure, nuclear power, new energy, aviation, finance and other sectors,” Chinese President Xi Jinping said in December. Israel may have a role in Sino-Egyptian cooperation. As aforementioned, Israel can provide advanced agricultural technologies to support the industrialization of Middle Eastern countries in the context of One Belt, One Road. China’s policy-making is careful, conservative and consensus-driven. Its overriding concern is its own economy. The pace of transformation of the Middle East has surprised it, and it is trying to decide what to do next. What China will do in the future cannot be predicted. But it seems inevitable that China’s basic interests will lead it to far greater involvement in the region, all the more so as the US withdraws. Israel will remain an American ally, and this alliance strictly delimits the scope of Sino-Israeli collaboration. Within these limits, though, Israel has great room to maneuver, and the opportunity to help shape Chinese thinking and strategy in the region for decades to come. David P. Goldman is a Managing Director at Reorient Group, a Hong-Kong based investment bank, and a member of the Board of Advisors of Sino-Israel Government Network and Academic Leadership (SIGNAL). His book How Civilizations Die (And Why Islam is Dying, Too) was published by Regency Press in September 2011. A volume of his essays on culture, religion and economics, It’s Not the End of the World – It’s Just the End of You, also appeared that fall, from Van Praag Press.